SYNTHESIA | gURROO - A new generation of innovative minds. One common condition of an industrialized capitalist society is the stratification and isolation of its populace; this is no more apparent than in mega-cities such as New York. New technologies provide the capability to diminish this condition, yet, so far, these technologies have remained in the virtual realm. The intersections of information, life, machines and matter display complexities that suggest the possibility of a much deeper synthesis. Synthesia is a project that aims to eliminate social divisions and develop a new state of human connectivity through blurring the boundaries between local and regional scales, virtual and physical realms and internal and external conditions. Utilising regional data sets from analysis of online social activity and local environmental data through various instruments, (including motion detectors, microphones and a wireless emotional sensor developed by MIT.) Initial predetermined functions are employed to initiate the process of developing a heightened sense of collectivity, these functions alternate periodically. Synthesia then uses intelligent, cybernetic systems to learn and adapt the primary functions to create a hybrid, evolving model therefore enhancing the experience and developing a collective nervous system. 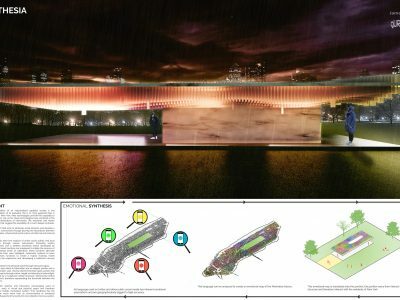 The project is manifested in the physical realm through interactive glass elements placed on each block in Manhattan and an elegant pavilion set in Central Park. 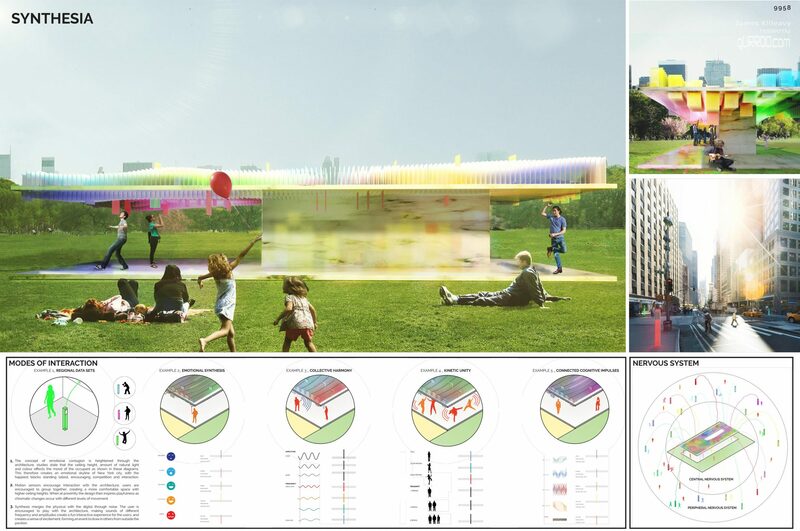 This pavilion uses moving electrochromatic glass panels that embody the various inputs through colour, height and intensity of natural light. 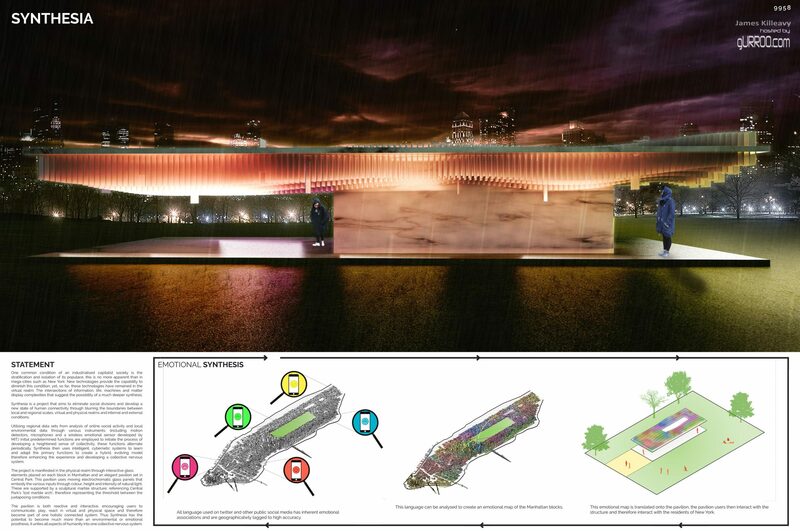 These are supported by a sculptural marble structure; referencing Central Park’s ‘lost marble arch’, therefore representing the threshold between the juxtaposing conditions. 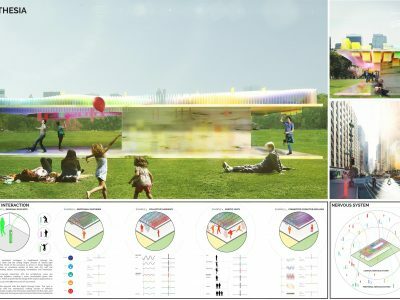 The pavilion is both reactive and interactive, encouraging users to communicate, play, react in virtual and physical space and therefore become part of one holistic connected system. Thus, Synthesia has the potential to become much more than an environmental or emotional prosthesis, it unites all aspects of humanity from aural communication to cognitive impulses into one collective nervous system.